Until you find a broken concrete statue or urn, you might not realize that cement statuary & planters are actual very breakable. Over time, weather can affect the stability of your cement garden antiques making them more susceptible to damage. Prevention is the best approach. If your garden pieces are too big to store for the winter, tip your urns upside down so water & snow can’t accumulate inside and cover your statuary with shrub covers or tarps. But if it’s too late for prevention and you find yourself with broken cement, take heart and head to the hardware store! Pre-mixed concrete patch comes in ready-to-use tubes. This convenient patch mix can be used as a crack filler or as an adhesive to reattached broken pieces. 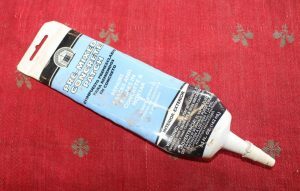 Over the years, I’ve used this simple mix to fix all kinds of cement garden antiques. As a glue, apply it to both surfaces and brace the area until it dries. As a filler, I use my fingers to blend it–if the color isn’t an exact match, I add dirt or moss and feather the patch out into the rest of the piece. One of my favorite fixes for furniture scratches is Old English Scratch Oil. As you can see by the photo, I use mine all the time! Essentially, it’s furniture oil with a little bit of stain in it. It comes in several different shades and you just rub it on the surface. If you’re doing a table top, rub it over the entire surface–the oil with color the scratches while cleaning and polishing the entire surface. A great quick fix! Forget the fancy, expensive, record cleaning products! Here’s an easy and economical way to clean your vinyl (Wingo has been cleaning his records this way for years). Get yourself a can of denatured alcohol at your local hardware store. Put the denatured alcohol, undiluted, into a spray bottle. Spray your record lightly and, using a soft cotton rag (old t-shirts are perfect), wipe in a circular motion with the grooves of the record. Denatured alcohol cuts through the grime without damaging the vinyl. With gratitude to Tim Sullivan & The Secret Agency of Rollinsford NH, we are happy to welcome you to our new web site! This has been on our “to do” list for a number of years but between construction projects, renovations, the constant flow of new inventory, and our commitment to being open 7 days a week/365 days a year, the web site project has always take a back seat. But no longer! Tim was able to take my “chicken scratch” and turn it into a working web site that represents our esthetic & our vision. And beyond that, he is teaching me how to do it myself! So welcome to the virtual version of RS Butlers! And thank you, Tim!